Finding a furnace consultant for your seasonal needs is no mean task. However, most house owners and commercial businessmen rely on the advices of the HVAC contractors in Toronto who offer excellent tips on grabbing the best deals of the season. Here is a collection of 5 really cool and unflinchingly cost-effective tips on choosing between new furnaces and rental units. Permanent house owners can safely pick either a new furnace or the one available on rental basis depending on the needs of the family. For tenants, it is obviously safe to pick air conditioner installation and boiler installations on a rental basis. The hours of use per day, is the next big thing that will help you in making the decision. If you plan to use the furnace in Mississauga everyday, but only during the winter season, pick the rental offers. For those who live in the outskirts of the city and along the lake side might choose to go with the new units, especially if they intend to use it only when it gets cold at night. If your daily use exceeds 6 hours, go with furnace rentals. Size of the family can drastically bring down the quality of the heating expected from even the best furnaces. In case, you make a wrong choice while buying a new unit, it can be massive expense to replace. However, furnace rentals offered in Toronto by leading contractors eliminate this possibility. Not only do they offer pre-installation assessment to help you pick the most efficient furnace, but also guarantee easy and quick replacement in case you are unsatisfied with the heating and air quality. If you get the latest high-end furnace on rental, pick it over the new one. Obviously, it gives you the opportunity to explore latest furnaces when they arrive later down the years without repenting on the choice made and the stress of upgrading to the new one. 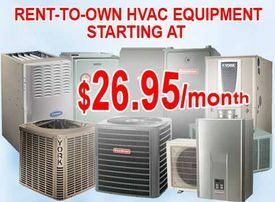 At much lesser price of ownership, furnace rentals offer best units on zero-cost and affordable maintenance package. 5. Kids and pets at home? This is another factor that favors the rental furnace units heavily. From boiler installation to ductwork installation, everything is taken care of as and when required. With new furnace installation, the ductwork installations are provided as one-tie operation. If you intend to have kids and pets in the near future, it is safer to pick furnace rentals to enjoy additional benefits of extra protection, just-in time maintenance and overhauling of circuits, vents and other hygiene related operations. Trace your needs online where you can easily find a wide-range of air conditioners, furnaces for sale, boilers and cooling fans. Based on the reviews and the price online, talk it out with the HVAC Contractors in Toronto if they can land you a great offer on the latest unit.